Toyota has tossed around a lot of money in the name of hydrogen, most recently with a project to build a fuel cell-powered big rig truck. But the Japanese automaker has also been trying to boost sales in the U.S. for its car of the future—the Mirai. But as Bloomberg reports today, sales are sluggish, and it should come as no surprise why: there’s barely any infrastructure to support the car. According to Bloomberg, Toyota had a slow start to building “enough” hydrogen fueling stations in California, which undercut sales of the automaker’s fuel cell vehicle, the Mirai, which is the Japanese word for “future.” The idea was to expand to the east coast of the U.S., with fueling stations in New York, Connecticut and Massachusetts. As the news outlet reports, however, those states are still waiting. Instead of having a dozen ready on the east coast by the end of this summer, Toyota and its partner Air Liquide SA expect to have three, maybe four, completed by the end of this year. Toyota sold 708 Mirai fuel cell sedans in the first half of the year in the U.S., with deliveries limited to select California dealerships. GM and Nissan each sold 10 times as many Chevrolet Bolts and Nissan Leafs, respectively. Tesla, which doesn’t report monthly sales, probably delivered about 23,550 of its electric vehicles in the U.S. in that same period, according to an estimate by researcher Autodata Corp. 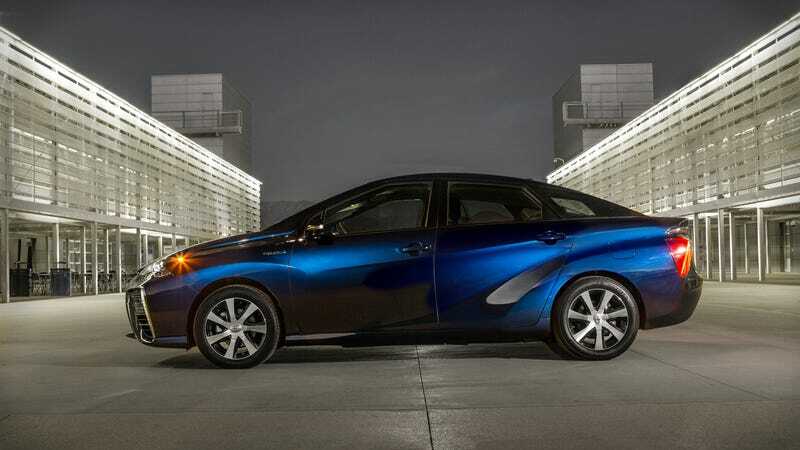 The leisurely pace of sales for Toyota is in part explained by the fact that only 28 retail fueling stations operate in the lone state where Mirai is being sold, according to the California Fuel Cell Partnership. The state’s powerful environmental regulator, the California Air Resources Board, originally estimated back in 2015 that 44 stations would be open by the end of that year. One of the biggest problems, according to Bloomberg, has been the navigation of local fire codes that aren’t equipped for hydrogen. But stations in Providence, Rhode Island, and Hartford Connecticut, are currently under construction and a dozen more are expected to come online in 2018. While slow, the inclusion of more stations is needed for Toyota, an automaker that’s bullish on fuel cells. Hydrogen-based cars get better driving range than other zero-emission cars and don’t require drivers to deal with the downtime that’s found at an electric-vehicle charging station. Toyota’s hoping to boost global fuel cell car sales to 30,000 by around 2020, Bloomberg says, and an expansion in the U.S. might make that goal more obtainable. Fuel cells make for an interesting technology, as we’ve noted in the past, but whether there’s enough quantity to power a substantive fleet of fuel cell-powered vehicles remains an open-ended question. And more importantly, if there’s a lack of fueling stations, the convenience of fuel cells and their ability to alleviate range anxiety will keep the technology where it’s at now: hypothetical for most, and existing in limited supply for some.